We love our Eggnog with a touch of Mint. This sparkly, fresh and modern DIY Holiday Invitation is perfect for a corporate party or fundraiser. The rounded edges on the mint green card are oh so elegant. Matching mint crinkly handmade paper bellyband adds more sparkle and cheer. Ties with a length of copper paper raffia. Fits in standard size #10 envelope, but our envelopes are not standard! 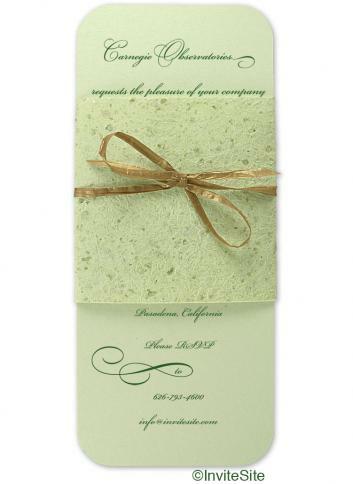 The pearlescent Italian paper envelope announces the importance of your event. Assembly: super easy. Rounded edges on mint green pearlescent Italian heavy cardstock. The minty and sparkly handmade paper bellyband announces a light and mirth filled holiday party is in the works. You can print these inkjet or laser. Or, we can print for you in gold, midnight blue, gray, or deep black ink. Kit includes a champagne pearlescent envelope from paper made in Italy. Invite Sheet:Mint Green heavy Italian Cardstock with rounded edges. Bellyband Sheet:Mint Green cotton rag with inclusions of real mica. Mailing Envelope:Champagne pearlescent #10 size envelope with classic deep flap.